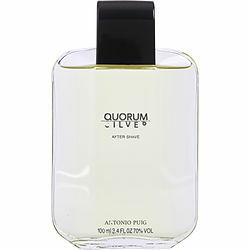 Add a distinct touch of masculine energy to your day with Quorum Silver by Antonio Puig. This classic scent mixes spicy cumin and juniper with the fresh aromas of lemon, pine, bergamot and jasmine. The rich scents of leather, amber and musk complete the blend. Introduced in 2005, this unforgettable cologne for men is the perfect way to add elegance to your daytime routine. Splash it on in the morning before a day at the office, and take advantage of the instant burst of confidence it brings. Quorum Sliver has an expensive smell that is not over powering but makes you feel good about yourself. For casual wear as it is not something that is high end except it has an stunning personality. This is a great scent that you can tell is expensive in comparison with the off the shelf aftershaves.